Disease pathogens and pests are always present. Yet not all plants come down with diseases or are attacked by pests. This tells us that diseases and pests are not unavoidable and that insects and plant pathogens are not the real cause of the problem. Pests and diseases are nature’s garbage collectors !!! Pests and diseases are merely there to eat or infect an unhealthy plant which is weakened. It is easy to see this as a nuisance but from our perspective, they perform an important ecological role. These unhealthy or defective plants would not be optimal for consumption of humans or animals and therefore these pests and diseases are doing us a favour by preventing us from eating inferior produce. However modern agriculture and horticulture have meant we can now simply kill off the pests and diseases using chemicals and eat the inferior produce anyway. Insect pests and diseases cannot successfully attack healthy, vigorously growing plants because, like humans and animals, healthy plants can deploy various methods of resistance. This means the key to reducing pesticide and herbicide costs is to grow healthier plants. Stressed plants may not be able to produce their normal resistance chemicals, and may even look and smell different to healthy plants. 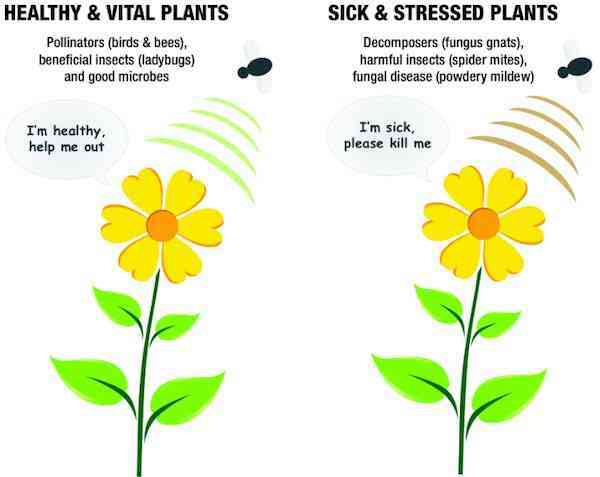 This is how pests and diseases locate sick plants to attack. A healthy plant that is growing and respiring normally will have good temperature control and give off a particular infrared wavelength. Using tiny hairs on their antenna, insects can detect which plants have a different temperature and give off a different infrared wavelength, and therefore track down suitable sources of food. Soil organisms directly or indirectly protect plants from diseases and pests. Beneficial organisms can work together in healthy soils to provide a proper balance of plant nutrients and growth factors which help to produce a vigorous plant that will be more resilient to environmental stresses. More specifically, certain fungi and bacteria compete with or directly attack disease pathogens by releasing natural antibiotics. Other fungal species actually attack and eat pathogens. A proper balance of nutrients must be present in order for plants to be healthy. If one element is out of balance (too high or too low), others can be affected and mineral deficiencies can result. These nutrients need to be balanced to ensure strong root systems, and growth as well as healthy, disease and pest free plants. Certain proteins and amino acids (known as secondary plant metabolites) are created in healthy plants. These are complex communication molecules which help the plant respond to environmental stresses and remain healthy. These metabolites can only be created when there is a proper balance of protein build-up and breakdown, resulting in balanced levels of amino acids, vitamins, and trace elements to nourish the beneficial microbes and their host plant – our crop. Excessive and inappropriate fertilization unbalances soil mineral ratios and adversely affects important soil microbe communities, making plants more susceptible to viral, fungal and bacterial diseases and insect attack. In short, insects and diseases attack our plants when they are unhealthy or under stress and their tissue has become suitable food for them. Our challenge is to keep the soil conditions right for optimum plant health so they are good for us. A holistic, broad-spectrum programme to balance soil mineral levels and boost soil microbe communities will provide the best form of ‘crop protection’.